Ilkley Harriers and the Addingham Gala Committee reintroduced a fell race at the Addingham Gala in 2010. Before the opening of the bypass in 1989 there was a fell race at the Gala, with a route up on to Addingham Moorside. Now the 'new race' is in its 6th year! Saturday 13th July 2019, Gala Day! The race is run under FRA Rules. It is a category BS fell race, 6 miles in length with 1000' of climb. The minimum age for entry is 16 on the day. You will need a reasonable level of fitness as the climb and descent are significant! 'P-shaped' course, descending by the same route you ascend by, details and map below. The race is fully flagged and marshalled. GPS allowed. The Complete Runner, Ilkley are generously providing race numbers and prizes again. exit via war memorial gate to Main St, cross over (marshalled), turn right and keep to pavements through the village along Main St., Church St., North St.
finish with a final sprint in front of the Gala field crowds! 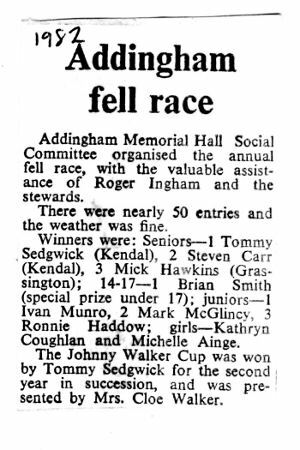 Before the opening of the bypass in 1989 there was a fell race at the Gala, with a route up on to Addingham Moorside. We understand this was continued for a year after the bypass was opened (! ), then moved to a route up Beamsley for a short period, then fizzled out to be replaced by a midweek evening race (see BOFRA calendar). Veteran members of Ilkley Harriers who won medals in the 1986 race recall that the route climbed Addingham Moor, ran along to the Noon Stone, then plunged straight back down. There were about 22 runners, from the photo below, including just one lady Alison Eagle, Runner B in the photo, who finished about half way up the field. Malcolm Pickering, Runner A in the photo, won a fine medal for 3rd place and remembers that there was also a track sprint event after the fell race. 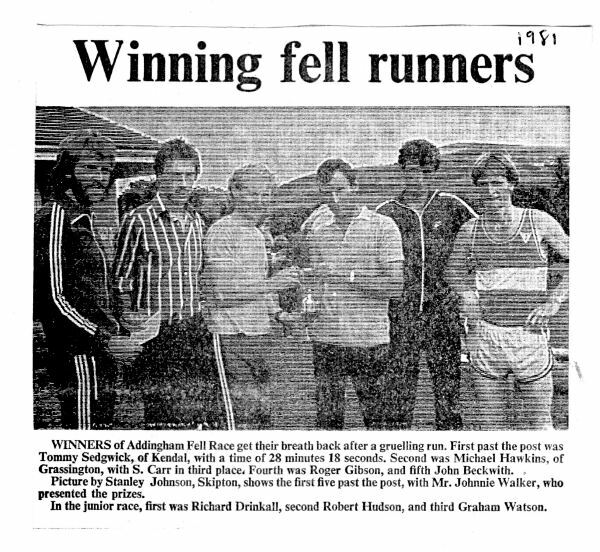 Some other runners in the photo .... Jeff Emmett (blue vest, fair hair, to left of runner A); Graham Hawkins (white vest, black stripe, to left of runner A); Kevin Wright (white vest, blue shorts. 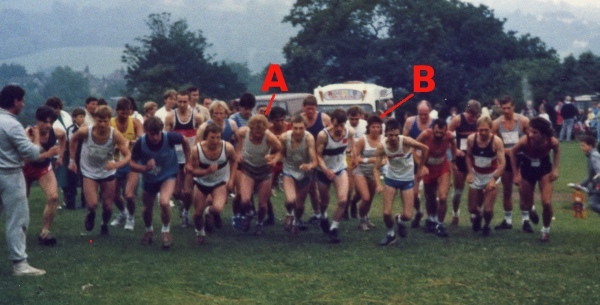 to right of runner A); Paul Buckley (behind runner B); Paul Judge (2 runners to right of runner B). And from Mark McGlincy ... the person on the far left in red shorts is Michael Griffin from Skipton, the runner in the yellow vest is Les Storton from Keighley, the runner left of runner A is David Schindler from Thorpe, the runner to the right of Kevin Wright with the blue band across vest is Colin Schofield from Fountains Abbey, and the tall person at the back with bald head in blue vest is John Ademson from Addingham. And if memory serves me right i can remember winning the junior fell race in possibly 1983/4 from Andy Preedy of Burnley. Mick Hawkins advises "Roger Ingham was involved in helping organise the first few and thinks it started in 1981. In '81 and '82 the race was held in the middle of September then I think '83 and definitely '84 the race was in July (same weekend as Alva).